As I write this, my daughter is packing for college far away. Soon her room will be empty and quiet. Family dinner will be just me. It’s tough on us when people leave, even if we know that they’ll be back. It’s tough on democracy too, when people are away from home and don’t vote. At home, even if we’re reminded to vote as late as Election Day itself, we can go to our neighborhood polling place. We might have seen an “I Voted Today” sticker, or a candidate’s poster, or a friend’s Facebook post, or heard about the election on the radio and still get to the polls before the 8pm cut-off time. When people are away, it’s harder for them to vote. It takes time and forethought to request an absentee ballot by mail, receive it, vote it and return it. The voter has to start the process early, before most media outlets and political campaigns have started reminding people of the upcoming election. Not voting hurts every group and community the voter is part of, which hurts the voter themselves. 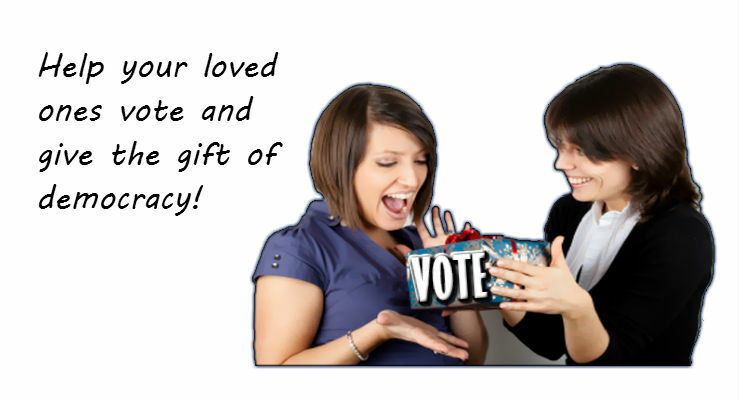 So help the people you love push for the issues they care about by reminding them to request absentee ballots. Follow up by reminding them to vote and return the ballot. The time is now! It is not too early to request an absentee ballot for the November 4 election. Don’t let your loved ones wait too long. The deadline for returning a regular absentee ballot is the Friday before Election Day (October 31, 2014), but that’s just the last step in the process. Any voter who expects to be away on November 4 can go now to the County Board of Elections to request, vote and return an absentee ballot all at once. In Philadelphia, this can be done in Room 142, City Hall, and it takes about 15 minutes. It’s a bit like early voting in other states, but only for people who genuinely believe that they will likely be absent from their county on Election Day for work or other duties. If plans change and the person is home on Election Day, that’s not a problem — they should just vote at the polls, in which case the absentee ballot just won’t be counted. What if someone is in the hospital? In the military? Called away the day before Election Day? Physically unable to get to the polls? Detailed procedures are available at www.VotesPA.com and at the County Board of Elections (215-686-3943). Absentee ballot request forms are available there too. While you can’t deliver your loved one’s ballot (unless they formally designate you as an agent), you can print out or pick up the ballot request form for them. By the time this article is published, I will be urging my daughter to vote and return her absentee ballot. She might not enjoy my nagging, but she knows it’s just another way for me to tell her I love her.